After a promising rise on the global stage that included hosting the 2014 World Cup and the 2016 Summer Olympics, Brazil today is entangled in profound economic and political crises. Latin America’s largest country is not only trying to recover from its deepest-ever recession, but also facing political upheaval brought about by corruption scandals that have embroiled the last three presidents and the leaders of all major political parties. Here are five key findings from Pew Research Center about Brazilians’ views of their country’s ongoing economic and political challenges. 1Brazil’s economic conditions have worsened, and the public’s views about the economy have soured. Estimates from the country’s national statistical institute indicate that over 14 million Brazilians are out of work. Over the past three years, the nation’s jobless rate rose by more than 6 percentage points, reaching 13.7% of the labor force in the first quarter of 2017. Young adults are especially affected by the economic crisis: Nearly three-in-ten Brazilians (28.8%) between the ages of 18 and 24 are jobless, an increase of nearly 16 percentage points since the end of 2013. During this period, the country’s gross domestic product shrank by more than 7% and the industrial sector shrank by more than 12%. The national public feels the bleak state of the economy. About eight-in-ten Brazilians (82%) say their country’s economy is bad. That figure is double the share of the public who said this in 2013, one of the highest levels of economic dissatisfaction recorded in the global Pew Research Center survey. 2 The Brazilian public expects a recovery soon. While recent economic forecasts point to a slow recovery, the majority of the Brazilian public remains confident that the economy will bounce back in the near future. Nearly seven-in-ten Brazilians (69%) say the country’s economic situation will improve over the next 12 months, with roughly a third (34%) believing it will improve a lot. Individuals with higher levels of education are less optimistic about the future, however. About half (51%) of Brazilians who completed college believe the economy will improve, compared to 71% of those without university degrees. 3 Even before being charged with corruption, Brazilian President Michel Temer was less popular than his predecessors. Temer, Brazil’s current leader, has been charged with corruption amid allegations he participated in bribery. But even before the scandal, when Brazilians were asked about their views of the country’s current and previous presidents, Temer’s favorability trailed that of his immediate predecessors, according to a Pew Research Center survey conducted in March and April. In the spring survey, about one-in-five (21%) Brazilians had a positive view of Temer, including only 2% who had a very favorable view of him. About a third (34%) of the public had a favorable view of Temer’s former boss, impeached President Dilma Rousseff. And more than four-in-ten (45%) had a positive opinion of former President Luiz Inácio Lula da Silva, who is also under investigation. 4 Corruption is overwhelmingly seen as a problem by Brazilians. Ongoing investigations of corruption schemes have embroiled congressmen from all major political parties, the runner-up of the last presidential election and a third of Temer’s top officials. Not surprisingly, 95% of Brazilians say that corrupt political leaders are a big problem in Brazil, with more than six-in-ten (63%) saying corruption is a very big problem. 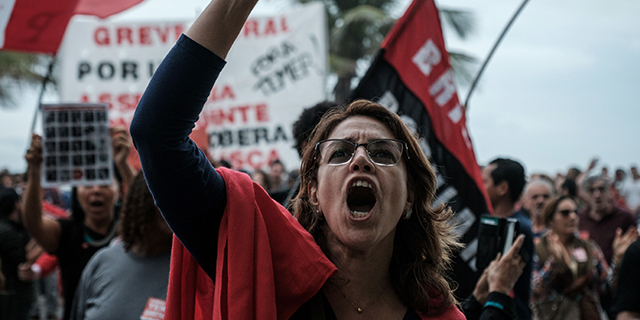 5Only about a quarter of Brazilians believe that political instability will get better. While the impact of the recent charge against the president and other ongoing investigations remains to be seen, 86% of Brazilians say political instability is a big problem for their country. Moreover, the public is skeptical that the current state of affairs in Brasília, the capital, will change for the better anytime soon. About four-in-ten Brazilians (42%) believe the political instability will get worse in the next five years, 29% say the problem will stay the same and roughly a quarter (24%) believe the instability will get better. Guilherme Russo is a research associate focusing on global attitudes at Pew Research Center.